Wrist wraps are eventually going to be on your gym accessories list. It’s not a matter of if, but of when. They can help you go through your WOD quite a lot, especially if you’ve suffered from wrist injuries in the past. Depending on your particular situation you want to pick the right wrist wrap and that’s exactly what we are here to help with. Find out what are the characteristics of a wrist wrap you want to look for, what are the best ones to consider, and what we would pick. Why Use Wrist Wraps for Crossfit? 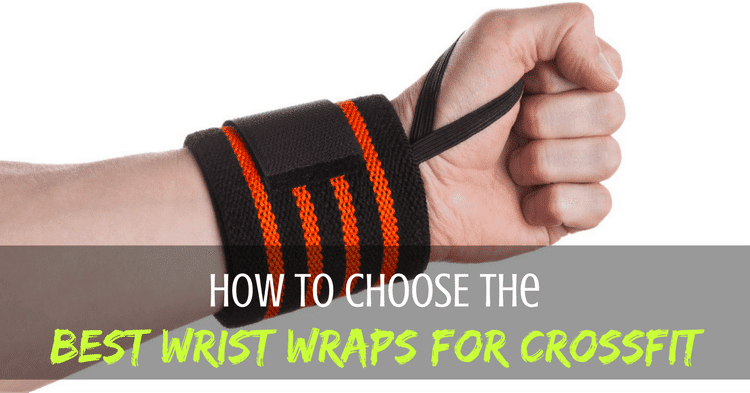 What’s the Difference Between Wrist Wraps for Crossfit and Lifting Straps? Crossfit is a sport which involves a lot of heavy lifting, right? A lot of the weight you pick up, especially when you are doing pushing type of movements such as bench press, dips or shoulder press, will sit on your wrist joints. At some point, when you are using weights which are heavy enough, you will actually start to feel discomfort or even pain in your wrists. That’s when wrist wraps come into the picture. They will support your wrist so that you can go through your WOD without feeling any (or that much) discomfort. Additionally, they can also improve your performance because you will be able to use more weight or do more reps without having your wrist take all that stress. Using wrist wraps is also a good idea if you are recovering from an injury. 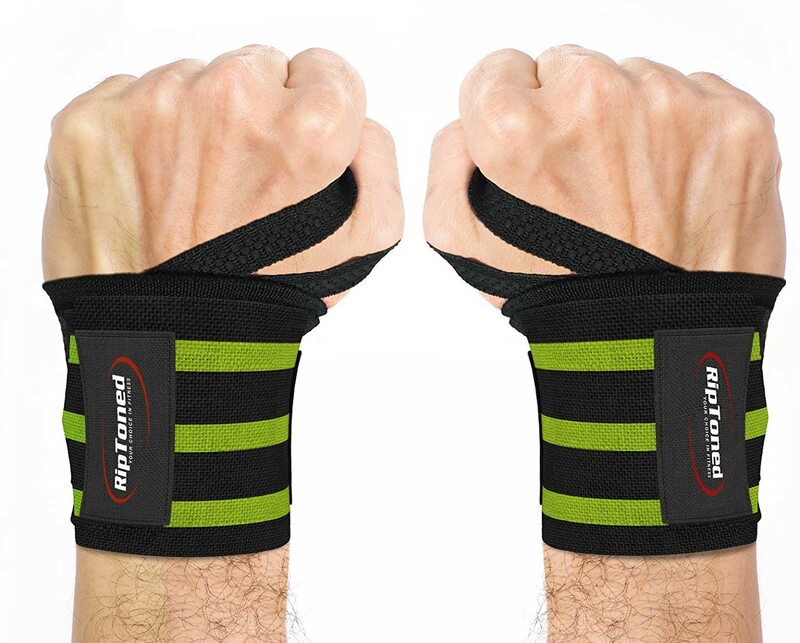 It will help you get back in the gym faster while protecting your wrist joints. These two gym accessories look relatively similar and sound relatively similar as well. And if you are not a seasoned lifter you might not be sure what’s the difference between them and which to use when. Both will go around your wrist, but they are quite different in the way they work. So, wrist wraps will get really tight and firm around your wrist and support your wrist from bending too much when you are using really heavy weights. Wrist wraps are used when the weight you are using is pressing against your palm. Lifting straps, on the other hand, are used to assist your grip. They will not provide any wrist support! So if you are doing some heavy dumbbell rows are your grip or forearm muscles are about to give in, that’s when you are using wrist straps. This small gym accessory can make a tremendous difference in your workouts. It might seem like all wrist wraps to the same thing and any model will work just fine. But there are quite a few characteristics you want to look at before buying. First and foremost you want to get a size which will actually fit you. You will select the size depending on how thick or small your wrists are and on how tight you want the wrist wraps to be. Some products come with a one size fits all option (which is not always the case), and some will offer 2 or 3 different sizing options. As a rule of thumb, if you have a small wrist and don’t lift that heavy you can pick a 14-18 inches wrist wrap. 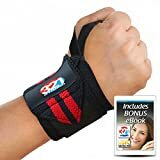 If you have bigger wrists or you lift heavy weights, you want to go with a 22+ inches wrist wrap, but no more than 30 inches. Beyond that, you will just lose your time wrapping and unwrap it. You won’t get any extra wrist support from it. The vast majority of wrist wraps will have a Velcro closure, but some use a cord you need to ties. The most convenient is the Velcro obviously. But you want to pick a Velcro which doesn’t come off to easy and which doesn’t lose its grip over time. The thumb loop is used to help you put on your wrist wrap easier, but also to help to hold its place and prevent it from moving around. First and foremost you want your wrist wraps to have a thumb loop because not all do. Next, you want the thumb loop to be well stitched to the wrap so it doesn’t come off in time and you also want it to feel comfortable around the thumb. Lastly, but just as important, you want to look at how the material feels on your wrist. You want to be firm, not flimsy so that you get good wrist support. The ends should be a bit softer so that the wrist wrap is comfy to wear and it doesn’t dig into your skin. If the wrap is made out of something you can machine wash without breaking anything that’s even better. 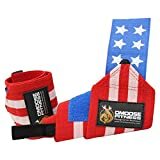 OK, now that we got that out of the way, let’s review the top 7 best wrist wraps for Crossfit of 2019. The Stoic wrist wraps are made out of a really nice combination of nylon and elastic. They come in 3 different sizes: 18, 24 and 36 inches long (not counting the loop and the hook). So there’s enough length to wrap them around your wrist so that you have the right amount of support. We found that the 24 inches version should be enough for any Crossfit user. Pass that point it will not get any more thither. The Velcro closure does the job at keeping it in place. The elastic fabric they used can be tightened or loosen up really easy, so you can crank it up to the point where you can move your wrist anymore. Or you can loosen it up so you have more mobility and less support. 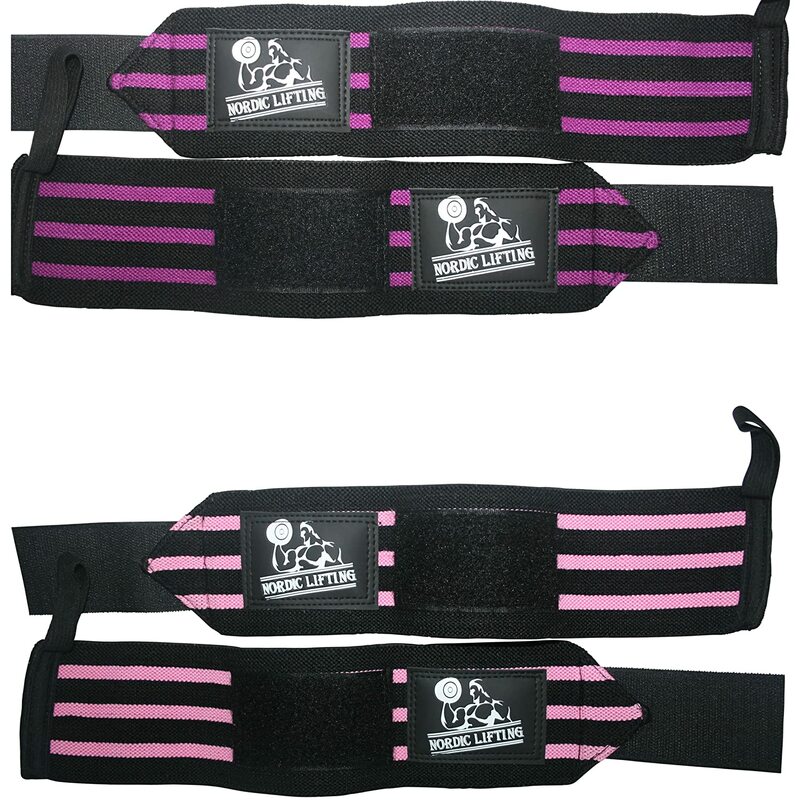 Next, in line, we have a pair of wrist wraps which comes in one sizing only – 18 inches. This is enough for users with smaller wrists. Or for Crossfit athletes which don’t need that much support. 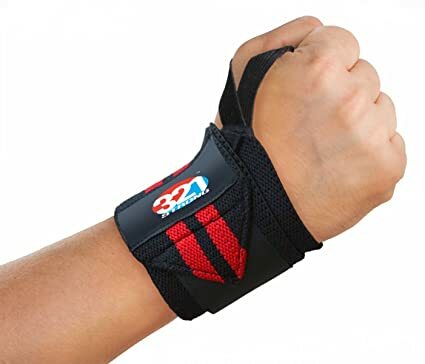 If you want a really tight wrist you may want to look at 22+ inches long wrist wraps. They do however come in 2 options: stiff and medium-stiff versions. So if you want to get better support you should go with the stiff version. Be aware though that these ones are really stiff and it takes a long time to break them in. Rip Toned did a good job with the stitching of the loophole, however, the loop seems to be over-sized a little bit. So the wrists can move a little and you will need to re-adjust every now and then. The design looks really good, and they come in a variety of different colors which will suit both males and females users. If you are looking for a package of 2 pairs, this could be an option. You will get 4 wrist wraps which will fit both hands, so there’s no left or right like in the previous models we looked at. These come in one size fits all, which is in fact just 14 inches long. It will work great for female crossfiters and users with small wrists. But if you have thicker wrists and you want better support you may want to look at longer wraps, such as the Stoic wrist wraps. The vendor doesn’t give much detail about the material they used, but apparently, it’s a combination of nylon and elastic. Speaking of the elastic, it has the tendency to loosen up quite a bit after a couple of weeks, especially on the loophole which goes around the thumb. The fabric seems a bit flimsy and doesn’t offer that much support so you will have the tendency to wrap them tighter which will cause damage in the elastic used around the wrists as well. The Rogue wrist wraps come in 3 different sizes: 13, 18 and 24 inches which pretty much cover everybody’s needs. The vendor is very transparent about the material used: 40% Elastic, 10% Polyester, 50% Cotton. There’s plenty of elastic in there to allow you to set just the right amount of tightness around the wrist. The cotton will absorb any sweat which will prevent them from slipping and moving around. On top of that, you also have the thumb loop which is a perfect fit. For the closure, they use a Velcro which unfortunately is not the best we’ve seen. It will start to lose its grip relatively quickly which basically makes the wraps unusable as there will be no more wrist support. 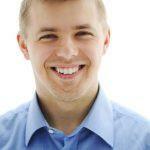 So you will probably need a replacement every few months. The stitching of the Velcro will come apart as well over time. We really liked the design and the color options. The logo is a bit bold, but overall these wraps look great. These wrist wraps for Crossfit come in 2 sizing: 14 and 20 inches. We would’ve liked to see a 24 inches version as well for the heavy crossfiters though. They are made out of a combination of nylon and elastic and they are a bit wider than most wrist wraps you can get your hands on. They will do a pretty good job at keeping your wrist tight, but the ends are a bit stiff and will dig into your skin. These wrist straps will come with a vinyl pouch you can use the carry them around and you can also machine wash them. The stitching job is great and looks like it’s going to last for a long time, just like the Velcro closure. The only weak point we noticed is the thumb loop which is the first part of these wrist wraps that is going to fray. Other than that everything looks spot on. 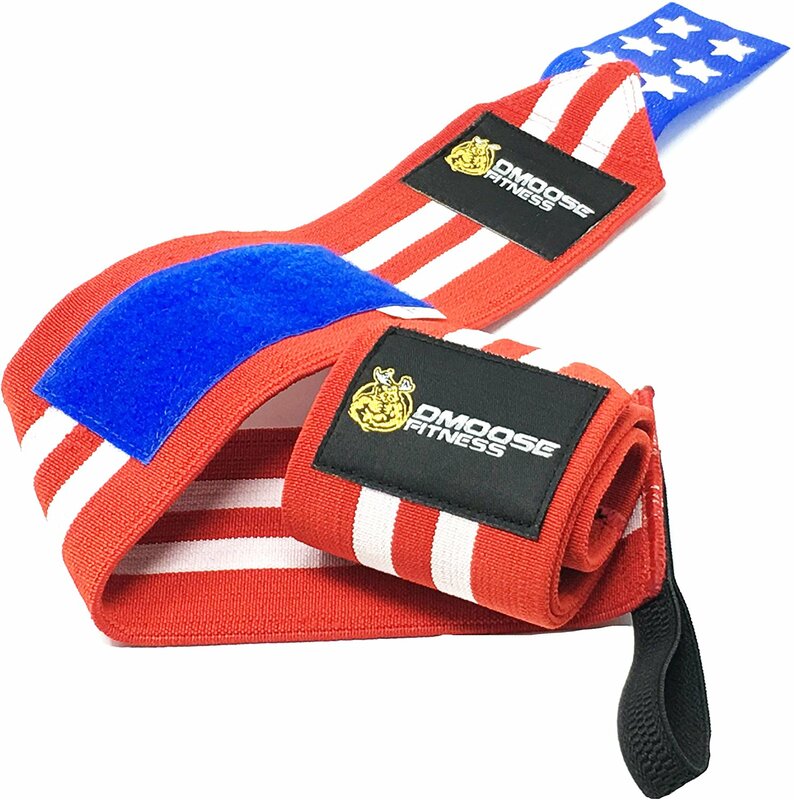 Available in 12 and 18 inches, the DMoose Fitness wrist wraps for Crossfit are an option to consider for users with smaller wrists or crossfiters that not really lift that heavy and don’t need that much wrist support. These are made out of a combination of comfy cotton, polyester, and heavy-duty elastic. They do indeed feel comfortable around the wrist, even though they are fairly thick and bulky. However the amount of elastic used doesn’t really allow to get them really tight around the wrist. So you will get a “medium” support from these. The Velcro closure holds better than in most wrist wraps. There’s a solid double stitching in there and the design looks absolutely phenomenal. We would go as far as saying it’s targeted more towards women because of the design. The thumb loop is well stitched to the wrap and has a perfect size. It will hold the wrist wrap in place without hurting your skin or thumb. 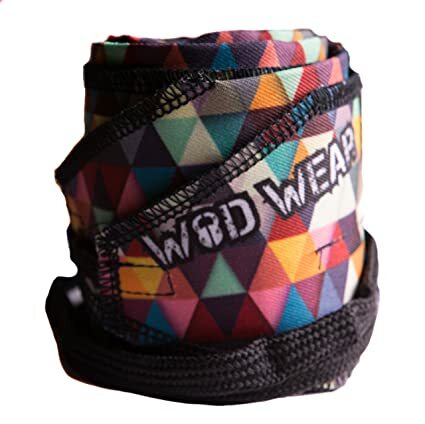 WOD Wear pulled off a really unique and out of the box wrist wrap. There’s no Velcro, no thumb loop and to elastic on this one. 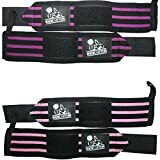 Even though at first they will look more like a fashion accessory rather than a wrist wrap for Crossfit, you may want to give these a try. They are made out of cotton 100% and they are super long – 33 inches. So the only way to get them tight around your wrist is to wrap it around so many times until you can’t really move your wrist anymore. Because there is no thumb loop, the wrapping process is a bit difficult, but eventually, you will get used to it. The amount of support they provide is about average. Instead of a Velcro, it uses a cord you need to tie around your wrist to keep them in place. So, it’s quite a little bit of work to put them on. The colors and design on these are nothing like we’ve seen in the competition. They look really cool indeed. If you are looking to buy your very first pair of wrist wraps and you are not really to the point where you can bench 315, you can go with the Rip Toned wrist wraps. You can pick between the stiff or medium-stiff to get the kind of support you are after. The overall quality is above average and you should be able to hit some new PRs with these on. 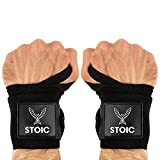 If you are a seasoned crossfiter, your best pick would be the Stoic wrist wraps. You have plenty of lengths to adjust it until you get the perfect amount of tightness. The Velcro is strong enough so they will not come in the middle of your set and you just get a good bang for your buck with these.